Carnyx & Co – Provides a unique interface between archaeology, the development of new instruments for quadriplegia and contemporary music. Welcome to the Carnyx & Co. website. Founded by Ian Ritchie and John Kenny in 1997, Carnyx & Co. is a charitable company which provides a unique interface between musical archaeology and the world of contemporary performance and recording. We have commissioned many new works featuring the reconstructed Deskford Carnyx, documented on seven CDs, three film sound tracks, and live performances and lectures world wide. Since 2000 Carnyx & Co has also become the parent organisation of a number of exciting ensembles and collaborative projects which continue to generate new work in the fields of contemporary and ancient music, film and theater. The reconstruction of this iconic Celtic instrument has become the catalyst for a wave of contemporary artistic expression. Since 2013 we have worked in partnership with the European Music Archaeology Project (EMAP) on the reconstruction of both the Tintignac Carnyx from France, and Etruscan litus and cornu. A twenty year association with Ancient Music Ireland has enabled us to participate in the study and performance of the most varied assemblage of Iron Age musical instruments found anywhere in Europe. These masterpieces of the European Iron Age are now all fully functional, and finding their 21st Century voices. The future is full of challenge and excitement as our current projects demonstrate. 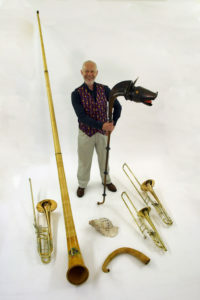 John Kenny and Ian Ritchie continue to work together to produce concert programs and projects which seek to level the playing field between able bodied and disabled musicians, to commission new works, collaborate in the reconstruction of ancient instruments, and to use those ancient voices to create 21st Century music. 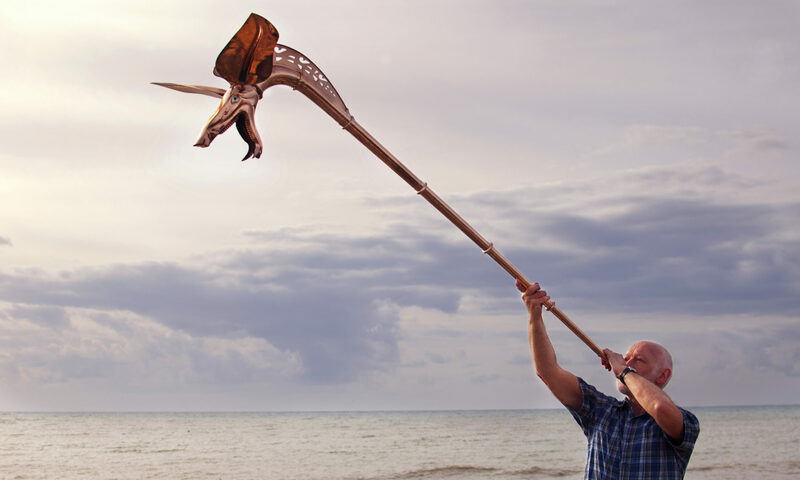 The Mouthpiece of The Gods continues to reach audiences of all ages and cultural backgrounds, telling the on-going story of the fabulous carnyx, and the evolution of the great family of lip reed instruments.